Expect a lot of running and a lot of physicality when Seattle hosts San Francisco Sunday night. Sunday marks the fifth meaningful game between the 49ers and Seahawks in the last two seasons, no other duo in the league can match that figure. The previous four games have followed a pattern - the 49ers win close games at home (winning by seven last year, by just two this season), while the Seahawks blow the doors off a seemingly overmatched San Francisco team when the location moves north (they won 42-13 in Seattle last year, 29-3 this season). Is this sample size large enough to draw the conclusion that Seattle will win by three touchdowns and that will be that? No. But is it a large enough sample size to draw the conclusion that Seattle is (probably) the better team and playing at home plays to their (assumed) superiority? It just might be. The teams have a number of parallels that make the matchup just as fascinating as it's AFC counterpart. Both play in the NFC West. Both have coaches formerly of the Pac-12. Both teams start 2nd-year starting quarterbacks, both of whom are deadly outside the pocket, both of whom are serious threats to tuck the ball and take off downfield, and both of whom were largely overlooked during the pre-draft process and ended up falling out of the first round (something that is now inexplicable in retrospect). Both teams are defense-first brawlers, who beat up their opponents at the line of scrimmage and create pressure in the backfield. Both teams have wildly underrated offenses that often get overlooked because of the strength of their defenses. Both teams are run-first offenses that feature a lot of zone-read package plays and creative formations. Both teams have wildly underrated passing attacks that often get overlooked because of the strength of their ground attack. Neither coach likes the other. Neither team likes the other. There are also a great number of differences. Seattle's defense is built on the strength of their secondary and their ability to force turnovers. San Francisco's defense is built on their defensive line and their ability to dominate the trenches. Seattle's receivers are nimble in space and win matchups in and out of short cuts or on crossing patterns. San Francisco's receivers are big and strong and win matchups at the top of the route. Seattle wins by committing to a scheme and overwhelming you with talent. San Francisco wins by adapting its scheme to the talent on-hand and out-coaching the opponent when the talent is lacking. In a lot of ways, this is the new Ravens-Steelers-type rivalry. Two hard-hitting defensive teams with quarterbacks who can make plays and two groups of players that genuinely seem to dislike each other. The Ravens and Steelers have met in the playoffs twice since the Ravens rebounded under John Harbaugh. The 49ers and Seahawks seem like they'll be on a collision course every year. Here's our preview for the late game (6:30 p.m. - FOX). I had him as a player to watch last week, but he's still the most important harbinger for San Francisco's success on offense, even more so than Kaepernick. Against Green Bay, Crabtree was nearly un-coverable. He sprung himself loose time and again and finished with eight catches for 125 yards. Against Carolina, he was very coverable, and finished with just three catches for 26 yards. And this is despite Green Bay producing substantially more pressure on Kaepernick and having a much more talented secondary. Crabtree injured his wrist in the first quarter and left the game shortly, but returned quickly thereafter and didn't appear to have his snaps limited in any way after that. A wrist injury would certainly affect his ability to create separation when there is contact, and perhaps would even deter Kaepernick from throwing him the ball in the first place (all else equal, Kaepernick might rather throw to someone who doesn't have an injured part of the body that catches the ball). Seattle had far and away the best pass defense in the league this year. If San Francisco's only reliable receivers are Anquan Boldin and Vernon Davis, frankly, they don't have a prayer of winning the game. Crabtree needs to be the Wild Card Round Crabtree, not the Divisional Round Crabtree if the 49ers want to have a chance to repeat as NFC Champions. In last week's game against Carolina, the 49ers had some trouble corralling Panthers tight end Greg Olsen, who finished with four catches for 55 yards, and saw another huge gain down the middle of the field bounce off his hands despite being wide open. A lot of Olsen's routes were the traditional stick/seam routes that often accompany playaction fakes from the shotgun or pistol, which is exactly the way that Seattle orients their passing game. Miller doesn't have the foot speed that Olsen does, so running him down the seam of the field following a zone-read fake isn't going to bring back memories of Antonio Gates in his prime. But it's an area of the defense that was partially exposed last week, and could be worth looking at. All due respect to Patrick Willis, but Bowman has been the best linebacker in a stellar 49er group and, maybe, the best inside linebacker in football. Since this game will likely come down to which team can run the ball better, I would think the versatile 'backer's ability to locate and deliver hits to Marshawn Lynch BEFORE he gets to the line of scrimmage will go a long way toward a San Francisco victory. On the flip side, if Bowman isn't plugging up holes on the inside and stretching out zone handoffs to the outside, allowing Lynch to build up momentum behind his pads, San Francisco will have to commit even more resources to stop Beast Mode, opening up room down field for the Seahawk receivers, and room on the backside for Russell Wilson to run the feared zone-read. Bowman is one of the league's best, but so is Lynch, and I have no doubt there will be more than a few violent collisions between the two. It will be strength vs strength, and whichever prevails will dictate what the other team is able to do when Seattle has the ball. It seems like a cop-out, but that really is the big story here. In the Week 2 bloodbath that Seattle won handily, they sported a +4 turnover margin. In Week 14, when San Francisco won by two, the turnover battle was even at one apiece. In the first meeting last season (which San Francisco won), it was again a 1-1 draw in turnovers. In the 42-13 drubbing later last season, Seattle won the turnover battle 2-1, and their only turnover (a Russell Wilson interception) came when they were already up 20-0. Seattle's pass defense versus San Francisco's pass offense is the key matchup here - Seattle intercepted 28 of their opponent's passes, by far the most in the league. Meanwhile, San Francisco threw just eight interceptions this season, the fewest of any team in the league. Seattle forcing turnovers where San Francisco doesn't normally commit them would basically be curtains for the 49ers. But if it stays even, the game will be close. Now, you may expect a last-minute game winning drive from Sunday's other pair of quarterbacks, but don't sleep on the two young guys playing in this game. While nobody will confuse Colin Kaepernick with Peyton Manning or Russell Wilson with Tom Brady, each has led their team or four game winning drives in the fourth quarter this season. Both rank just behind Brady and Geno Smith (WTF? ), who each have five. Not saying this is going to be a shootout by any stretch, but each of these guys can move the chains with his arm and his legs, making them especially dangerous when opposing teams bring pressure and don't hit home. Something about this game, and this matchup, makes me think the score is going to end up with some really unorthodox numbers, and maybe even a safety. I don't think either team will be able to sustain long drives consistently against the opposing offense. Scoring drives will be set up by turnovers, big punt or kick returns, a busted coverage in the secondary, or one of the two quarterbacks escaping contain and breaking a 27-yard run on 3rd-and-9. The 49ers are the "hot" team, and they're better coached, but Seattle is the more talented team, and they're playing at home (and they're one of the few teams where home-field advantage genuinely seems to matter above and beyond the generic three-point Vegas bump). It'll be a game that's somehow simultaneously sloppy and entertaining, but the Seahawks should pull it out. Both the Seahawks and the 49ers have several compelling reasons to believe they'll win this NFC Championship Game, and that's what makes this match-up so sweet (besides the fact that these two squads, coaches, and cities absolutely hate each other). 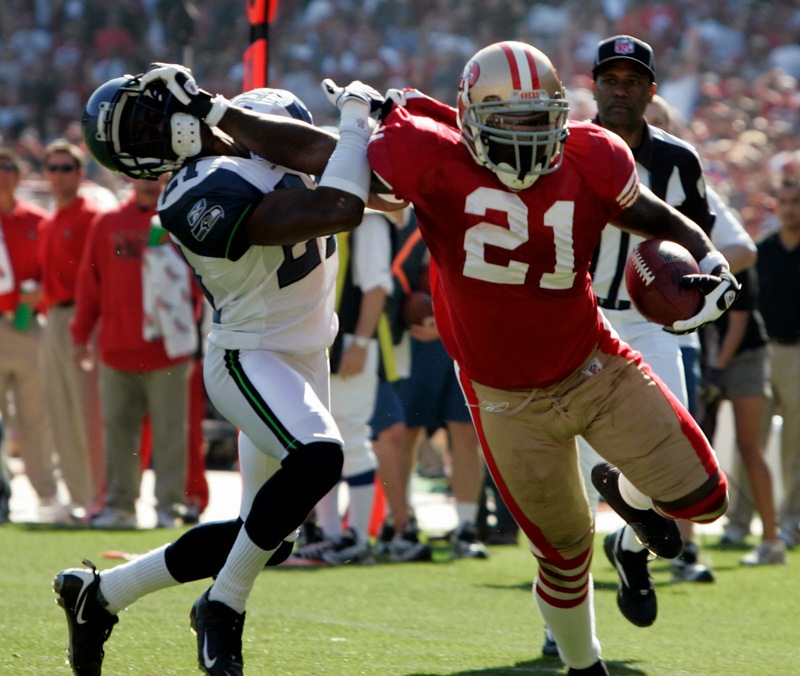 I think the 49ers - now that they're fully healthy - are a cut more talented than Seattle, and it showed in the two teams' last meeting in San Francisco, when they outgained and beat the Seahawks at home. CenturyLink Field, though, has proven to be the great equalizer in the past. In Colin Kaepernick's two starts there, the Seahawks have beaten the 49ers by a combined score of 71-16, and that huge discrepancy has been a result of turnover-fueled 49ers' meltdowns. With eight straight wins under their belt, San Francisco is the hottest team in football right now, and I think their recent road success will help them find the steady offensive hand on Sunday. For that reason, I see a 49ers upset victory. The 49ers defense again rises to the occasion, shutting down another dual-threat quarterback to make it's second consecutive Super Sunday appearance. On offense, receivers Michael Crabtree and Anquan Boldin beat the Seahawks at their own physical game, out-muscling the Seattle secondary for a touchdown each, while Frank Gore and the gang hold onto the ball long enough to put this one on ice. Seattle has been the better team all year long, and they're darn near impossible to beat at home, but San Francisco really impressed me last week, and you know I've dubbed this a team of destiny. That being said, I'm sticking to my pre-playoff picks and taking the Niners to face the Pats in Super Bowl XLVIII.